It's no secret that a pasture rotation is far more beneficial to grass quality and pasture yields than continuous grazing. But how often should you be moving your cattle to fresh pasture? How many grazing slices do you need? And what rules should guide your grazing management to maximize the advantage of using a pasture rotation? A pasture rotation is designed to recreate a wild herd migration. Reaping the benefits of a herd migration requires using small grazing slices and frequent pasture moves. The maximum advantage comes from using daily pasture moves. Daily pasture moves unlock potential in your pastures that cannot be unlocked with less frequent moves. Less frequent pasture moves (even every two or three days) simply don't have quite the same effect. Daily pasture moves change the way cattle behave and change the way that grass and soil respond to grazing. As a result cattle get consistent high-quality pasture every single day. Pasture yields go up. Cattle gain weight faster. And the grazing program can continue far longer after the growing season ends. This article, the first in my four-part Core Grazing Rules series, explores these remarkable changes that happen to grass, soil and cattle behavior in a daily pasture rotation. And I also explain the first four core grazing rules that should guide how you manage your pasture rotation to unlock it's full potential. In case you're wondering what it takes to build and operate a daily pasture rotation, feel free to peek ahead to my smart electric fence grid series. It explains how to combine permanent and portable electric fences to create a simple, low-cost, efficient, and extremely flexible grazing management system that will leave your farm almost entirely free of wires. When cattle are moved to a fresh slice of pasture every single day, their grazing behavior changes. Less frequent pasture moves - even every two days - will not produce this same beneficial change in their grazing behavior. It comes down to simple cow psychology. In a daily pasture rotation cattle quickly learn that they don't have time to wander all over the entire pasture to search out the best mouthfuls of grass. There's no time to be this picky. Every animal has to hurry up and eat what it can before the herd eats its way through the entire pasture slice. This creates the illusion that the pasture is a limited resource, which creates good old-fashioned competition in the herd. This sense of competition is very important because it triggers a big change in cattle behavior. It forces cattle to graze like indiscriminate vacuum cleaners, gorging on whatever forage they can get their teeth into because right next to them are a hundred or more hungry mouths tearing away at the pasture. This indiscriminate grazing behavior is extremely beneficial to the pasture. Everything in the pasture will be grazed more evenly, weeds and all, because there's no time to be choosy. The most and the least tasty grasses all get vacuumed up together. And the stubble left behind is much more uniform. And it's not just the pasture that benefits from the intense grazing competition that arises during daily pasture moves. It also causes the cattle to eat faster and eat more, which leads to faster cattle weight gains. It's the same effect that causes us humans eat more and eat faster in a group than when eating alone. It's what I like to call the "Thanksgiving Dinner Effect" - the combination of taking too much food to avoid missing out later in case all the good bits are gone when you go back to refill your plate plus the subtle psychological pressure to keep eating because everyone else is too. This is a dramatic change of behavior compared to the selective grazing style that cattle switch to when they have more than a single day's grazing at their disposal. With more than a single day's grazing available at any time, cattle stop grazing as a mob. They fan out and become very picky, searching out only the most tasty grasses while ignoring the rest. They eat less. They overgraze the most tasty grasses. And they barely touch the weeds and less tasty grasses (over time this gives a competitive advantage to the less desirable plants and weeds). The grass stubble left behind by less frequent pasture moves is very uneven, with some plants grazed right down to bare soil while other plants are barely touched. The only way to end up with a consistent stubble is to graze everything right to the ground, which leaves many plants severely overgrazed and vulnerable to drought, and exposes the soil to far greater evaporation. The consistent grazing pressure and more even stubble produced by daily pasture moves gives you far more management options, which I'll get to shortly. Always use DAILY grazing slices. Daily pasture moves alter the behavior of your grazing herd, forcing the herd to graze much more uniformly. The secret behind daily pasture moves is simple cow psychology - understanding what motivates cattle and how their behavior changes in response to the grazing environment that we create for them. The root mass below ground roughly mirrors the green vegetative material above ground. Roots have to collect enough nutrients and water to support the mass of plant material above ground. But the plant also needs enough leaves to collect enough energy from the sun through photosynthesis to support the root mass below ground. The plant must therefore always either sacrifice root material or slow its above-ground growth in order to maintain the balance between roots and leaves. Once you switch to daily pasture moves, things start to get interesting. Daily pasture moves allow you to leave behind a very uniform stubble after grazing. And that give you the opportunity to boost pasture yields simply by controlling the timing of your grazing and the height of the stubble left behind. How fast your pasture grasses grow depends on how tall they are and how close they are to maturity. Short grass grows quite slowly because a large portion of its energy reserves are redirected towards building up the root mass in preparation for supporting a larger plant. Once the grass has built up sufficient root reserves to support a larger plant, it will begin to grow much faster. For many grass species this magic moment occurs once it reaches 6 to 10 inches in height. But once grass reaches maturity, growth slows and then stops altogether. The plant's energy reserves are instead redirected towards seed production. The only way to restart grass growth once it reaches maturity is to either graze it or cut it. However, when grass is grazed or cut shorter than approximately 6-10 inches, the root reserves below ground die back because there isn't enough green material above ground collecting sunlight (photosynthesis) to support a large root mass below. Growth will slow significantly until the plant re-grows back to 6-10 inches in height, at which time it will again be able to support sufficient root mass below ground to support rapid grass growth above ground. You can probably see where this is going. By manipulating the timing of your grazing you can increase pasture yields. Always leave a tall stubble (minimum 6 - 10 inches) during the growing season to prevent growth from slowing after grazing. Re-graze pastures before seed production causes growth to slow. The graph below illustrates this concept. To maximize grass growth time grazing to prevent grass from going to seed and always leave a minimum 6-10 inch stubble after grazing. A daily pasture rotation allows you to manipulate more than just pasture yields. It also allows you to improve the quality of your pastures, again simply by manipulating the timing of your grazing and the height of the grass stubble left behind. Grass maturity directly affects grass quality. It's common knowledge that green growing pasture provides cattle with better nutrition than old, mature, dry grass that's gone to seed. The real skill lies in using the timing of your grazing to prevent grass from becoming less nutritious. As grass reaches maturity and begins seed production, growth slows and and the plant begins transferring nutrients from the green leafy parts to the seed head. The leaves dry out and die, which causes nutrients to be lost to weathering and leaching. Once grass reaches maturity, its nutritional quality declines very quickly as it is exposed to the ravages of sun, rain, wind, and snow, and as the plant drains nutrients from the leaves in order to use them for seed production. Growing plant leaves are not just higher in nutrients. They are also much better at protecting those nutrients from the elements. The outer surface of growing grass leaves are protected by a waxy surface that helps to seal out the elements. That's why dead grass soaks up moisture while water beads up and runs off the surface of green growing grass. Even in the autumn after grass has been killed by frost, as long as the grass did not go to seed it will retain its waxy outer coating. This allows it to preserve its nutrients much longer during the winter, which is key to creating high quality grass reserves for winter grazing. This is in stark contrast to mature grass that has gone to seed, which will rapidly be leached of its nutrients shortly after the growing season ends. The key to high quality pasture nutrition is to prevent grass from going to seed. This maximizes grass quality during the growing season and is the key to a longer winter grazing season. This has direct implications for how you manage your rotational grazing strategy. During the growing season you want to do everything in your power to prevent your grass from going to seed. Your pasture rotation is your most important tool to help you accomplish this goal. Speed up or slow down your grazing rotation to keep grass from going to seed. Sometimes this means your pasture rotation has to move so fast that your cattle only lightly top-graze the rapidly growing grass to nip off the maturing plant tops. Then as grass growth slows, you will slow your pasture rotation and graze more thoroughly (as long as you still leave that vital 6-10 inch stubble!). Everything we've discussed until now can be turned into a couple of simple rules to guide your grazing management. Grazing Rule # 2 is about maximizing grass growth and grass quality by preventing grass from going to seed. Speed up or slow down your pasture rotation to prevent grass from reaching maturity and going to seed. Sometime your pasture rotation will need to move so fast that pastures will only be grazed very lightly (a quick top-grazing) to keep up with the rapidly maturing grass. But then as grass growth slows during the mid-summer heat or towards the tail end of the growing season, you'll need to slow down your rotational grazing. Just remember to always leave at least a 6-10 inch grass stubble! This is very different from the typical cattle grazing style where cattle are forced to completely mow pastures down before proceeding to the next pasture, as though harvesting a hay crop. You don't need to use up a pasture completely before moving on. The grass that is left behind is not "wasted". It'll still be there the next time your pasture rotation comes around. And the tall stubble will help to maximize your pasture yields over the full growing season! Grazing Rule # 3 is about maximizing grass growth by preventing grass from being grazed too short. NEVER graze grass shorter than a 6 - 10 inch stubble during the growing season. Leaving a tall 6-10 inch stubble during the growing season helps maintain a large root mass that can support rapid regrowth. A tall stubble also provides shade for the soil, which reduces soil moisture evaporation. Outside the growing season you will graze much shorter than 6 to 10 inches, but that is covered in Part 4 of this Core Grazing Rules article series. Additional benefit of a tall grass stubble: Since the root mass mirrors the green leafy material above ground, leaving a tall grazing stubble ensures that the plant retains longer roots that are able to draw nutrients and moisture from deeper in the soil. This reduces fertilizer costs, increases grass quality, and leaves your pasture more drought-resistant after grazing. Dip into your emergency hay reserve to let your grass catch up to your pasture rotation rather than graze shorter than 6-10 inches during the grazing season. Sometimes grass growth will slow down so much that the pasture rotation 'catches up' to the growing grass. It becomes tempting to graze shorter than 6-10 inches. Don't give in to this temptation! Many farmers make the mistake of grazing their pastures very short when they start running short on grass. When the rains finally do return, the remaining short grass roots are so feeble and the exposed soil is so parched that it takes considerably longer for pastures to recover. And even if moisture isn't a concern, the short grass height will take weeks to rebuild its root reserves before it can resume more rapid growth. There is a much more useful grazing management strategy to give your grass time to catch up with your pasture rotation without hacking into this vital 6-10 inch grass stubble. If you start running out of pasture during the growing season, feed a little hay to let pastures catch up rather than grazing shorter than 6-10 inches. This strategy ensures that you to keep your grass growing at its fastest rate so that the pastures produce more grass volume during the growing season. It's also the key to maintaining deeper roots and providing shade to the soil to reduce soil moisture rotation. It may seem silly to feed hay while there's still green grass left in the pastures, but a few weeks of hay fed in the summer may well extend your grass reserves by months later in the year simply because you had the discipline to maintain a tall grass stubble. Additional consideration: If you break this rule and continue grazing shorter than a 6-10 inch stubble during the growing season, you're reducing the amount of water available to your plants. Short roots can't reach as deep. And a short stubble won't shade the soil. That's why feeding a bit of hay if you start running out of grass is your first line of defense to reduce the severity and duration of any drought. 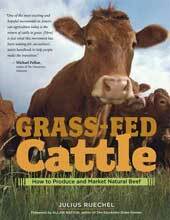 You can learn more about hay reserves, emergency grazing strategies, and how to protect your soil and pasture grasses during a drought in my book Grass-fed Cattle: how to produce and market natural beef. The first four core grazing rules described on this page focused on grazing during the growing season. But maximizing grass production is only part of the equation that will make your cattle business profitable. The biggest cost of raising cattle is winter feed. The longer you can continue grazing after the end of the growing season, the lower your beef production costs will be. Learning how to create high quality grass reserves for winter grazing is key to reducing your feed costs. Pasture is always cheaper than stored feed. This is the subject of the next article in this 'Core Grazing Rules' series. Why grazing winter pastures is cheaper than cattle feed. The Core Grazing Rules Summary - a handy stripped-down reference list of the seven core grazing rules, with links to explore each grazing rule in detail. 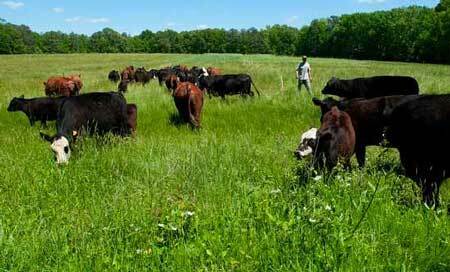 Raising Beef Cattle on Grass - How to prepare your cattle herd for your grazing conditions. Calving in the Pasture Rotation - How to manage your calving program on pasture in the midst of a daily grazing rotation.